What’s interesting to note here is that this is essentially a router with 8 GigE ports and the fibre is terminated in the unit. There is no public network socket. This is very different from a normal Rogers or Bell setup, where you can install either a router or an ADSL/router combo (for DSL) and get the public IP on your own router. What this means is that your existing router is pretty much useless, and everything is controlled via the Zhone 26xx. When the Beanfield tech left my condo, my router had been configured as an Access Point, essentially providing a bridge into the internal network provided by the Zhone. This means if you have a USB printer or a USB HDD attached to your existing router as a form of NAS, it is essentially useless as your old router will not have an IP address and will be inaccessible. At least this is how Beanfield configured my router, with the DHCP server disabled and DHCP provided via the Zhone 26xx. Re-enabled DHCP on the router (in the same range as provided by the Zhone 26xx). This setup is shown below on my router running Tomato. (Additionally, I have defined OpenDNS DNS servers to be assigned to clients.) The default gateway is the IP of the Zhone box, making my router forward all traffic to the Zhone 26xx. Gives the Wireless router an IP address so you can connect to it (USB NAS, USB Printer Sharing etc). Allows you to configure other services on the router (e.g. bandwidth monitoring, QoS, etc). Adds another hop in your network for devices not connected directly to the Zhone 26xx (no big deal as the router and the Zhone are connected via GigE). Another thing that is important to mention is that Beanfield provide a web interface to manage firewall ports on the Zhone, so you can do port forwarding. I had to e-mail Beanfield Tech Support to inquire as to how I was supposed to manage port forwarding. 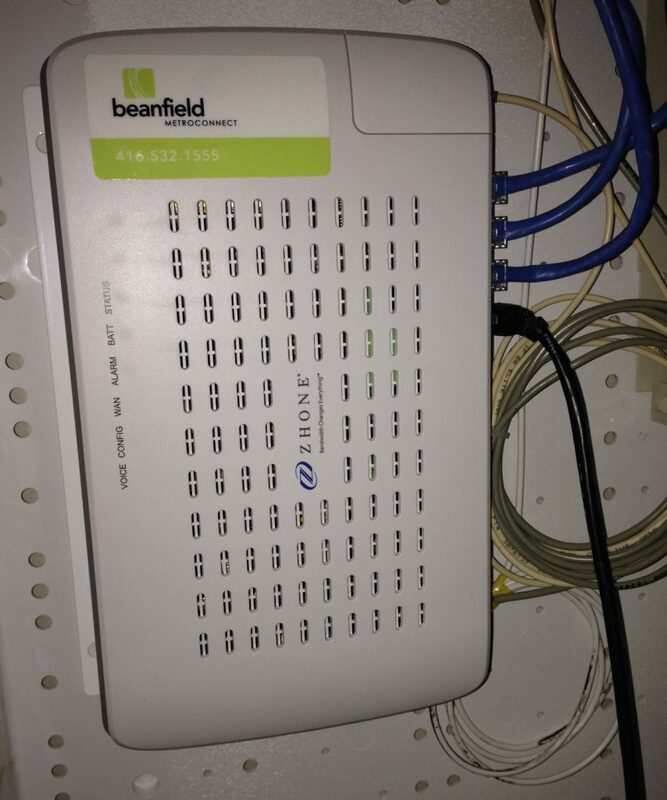 (Beanfield – you really should be providing this information to customers upon installation). While it’s a very basic web interface that is provided for controlling the Zhone 26xx, it serves it’s purpose. You can see some screenshots of this web interface below. Note: you cannot currently change the Local Network Settings on the Beanfield portal – for some reason, changes to this section will not save. Below is a screenshot of my Port Forwarding rules. 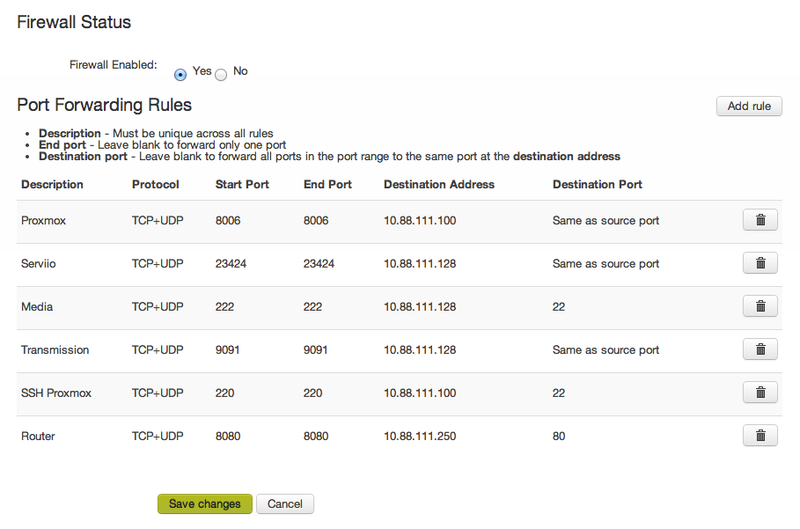 You can set up any combination of port forwarding rules, much like a full firewall config. 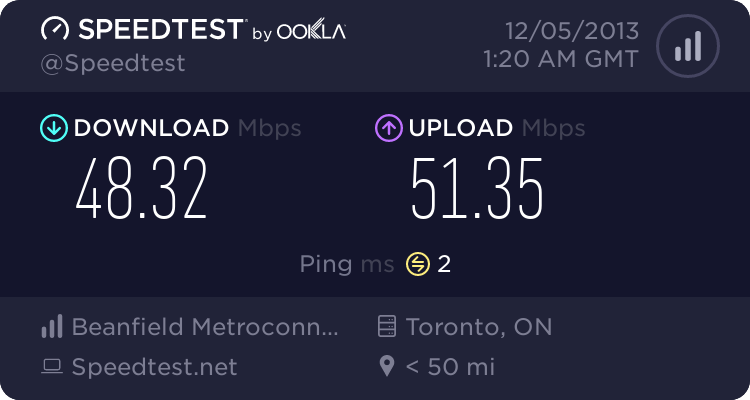 Overall, I’m very pleased with the Condo Connect service from Beanfield after 1 month. Below is speedtest results from Speedtest.net for my 50/50Mbps service. Sometimes the speed drops down to around 30Mbps, but on the whole it is pretty stable. I am not sure whether this is due to internal 2.4GHz interference with my Wireless Router, or whether it’s due to Beanfield themselves. I plan to test this with a 5.8GHz router when I get a chance, and will post my results here. Downloads max out at around 6.25MB/s, which is around the maximum theoretical speed for a 50Mbps connection, so I’m pretty happy. I can download an 4-5GB 720p movie in around 30 minutes. 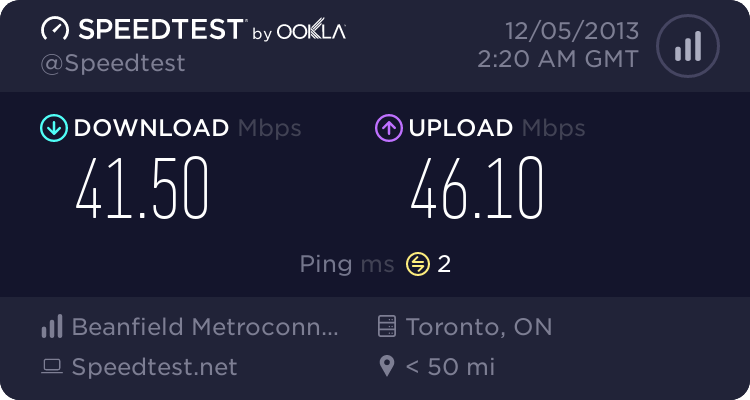 Overall, I would highly recommend Beanfield FTTH to people if you’re lucky enough to live in an area connected to their network. You can’t really go wrong for $45/month for a 50/50Mbps service with unlimited bandwidth. My only suggestion to Beanfield is that you need to provide more technical pre-sales information to customers on your website, which is extremely basic, and lacking any detailed information on the services provided (which may deter some customers). I look forward to seeing how competitive the iPTV service is when it launches, and then perhaps more Canadian consumers will finally kiss goodbye (or provide a middle finger) to Rogers and Bell. Nice article. I enjoy Beanfield and their service. Pretty fast and they upgraded those 50mbps to 100 mbps with no additional cost. That’s awesome. But the only problem I have right now, is that I can’t connect to my home network. Such as RDP, Router Admin, etc.. I understand your setup, but how what do you use as external ip address? I just use whatsmyip.net and use that ip address as the external url to connect to my home network but it doesn’t work? Any advice?